PROBOIS, the specialists in restauration, maintenance and stain application on patios and terraces. 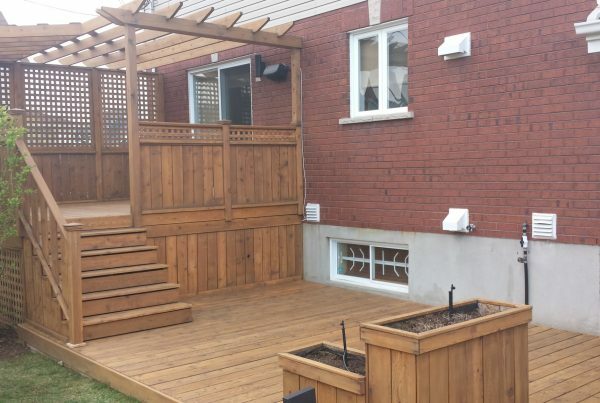 The best way to maintain a wood patio is to stain it before the humidity and the sunlight damages the wood. First, it is necessary to clean all the surfaces with the help of a stripper cleaner and a pressure washing machine. To clean all the surfaces of dirt that may have accumulated with time. To remove the resins and other natural products that still remain within the wood. To remove any dirt that might clog the pores of the wood. Having done so, the applied product will be achored more thoroghly within the wood and not simply on the surfaces. Next comes the neutralization of the surfaces with the help of a restorative conditionner for wood without bleach or chloride. The neutralisation process brings the acidity of the wood back between 7 and 8. The neutralisation process also removes any stripper cleaner that may be left inside the wood and may prevent the applied products of sticking properly. After we neutralize the surfaces we sand them with 60 and 80 grit sandpaper. This process ensures that the products will adhere to the wood. We sand the brands on the wood, those are the blue stamps that are often put on the wood. We sand with a fairly large grit because a sandpaper with a grit that is too fine will seal the pores of the wood instead of opening them. Often overlooked, this step is actually very important. As wood has been sandblasted as a whole, of fine particles are accommodated within the pores of the wood. Unleashing the pores is then essential to achieve optimal results. We apply two coats of sealer on the whole deck. Our sealers are very efficient, combined with UV protection, anti-fungicide and insecticides. Maintenance : This process has to be repeated every year since translucide sealers do not last more than four seasons. If the maintenance is not done, the wood will become greyish with time. The process of cleaning and preparation of the surfaces will need to be re-done. 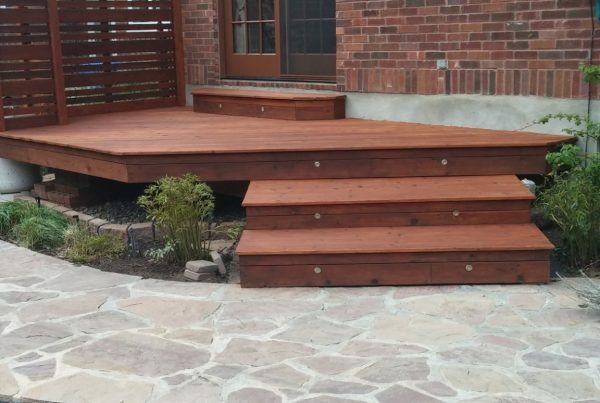 There are many products available on the market when it comes to exterior woods. First and foremost, the choice of the stain is a very important step. A premium quality stain will better protect the wood and last longer. We only use exterior stains of premium quality. Also, depending on the emplacement, type, age and function of the wood we use products taylored made for these characteristics. We use water-based and oil-based stains and both are eco-friendly and easy to maintain. It must be noted that a translucide or semi-transparent stain for exterior wood should never seal the wood on the horizontal surfaces. Indeed, the constant accumulations of water and humidity makes it so that the wood expands and shrinks much more than vertical surfaces. Therefore, a stain that seals the pores of the wood will most certainly begin to flake before long. Probois uses water-based and oil-based stain that seal the pores of the wood as little as possible. Stains that do not seal the pores of the wood will fade with time. Therefore, maintenance is much easier because the stain does not flake. Maintenance : Horizontal surfaces need a coat every two years, vertical surfaces need a coat every two to three years. An annual inspection is recommanded to ensure the quality of the stain and the needed maintenance. Saturated and ultra-saturated stains for exterior woods are very popular. However, it must be said that choosing an opaque color can change your options in the futur. Indeed, it is very difficult and sometimes impossible to strip an opaque stain back to the wood. Therefore, the choice of an opaque color is most of the time a definite choice. We apply two coats of opaque stains on all the surfaces, horizontal and vertical. If the result of the opacity is not satisfying then a third layer is applied. 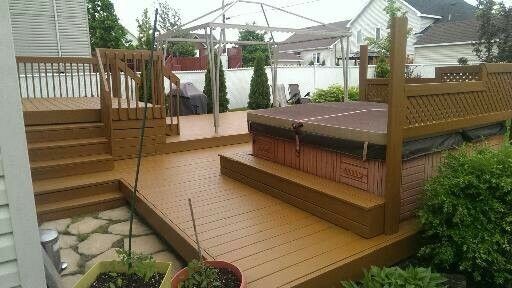 Maintenance : Two coats every two years on the whole deck will protect the wood and prevent it from flaking. First, it is important to make sure that the wood has been sanded in its entirety and correctly. We always sand the entirety of the walking surfaces of the ipe with grit 50 and 60 sandpaper. Ipe wood is a very dense and hard wood, it is therefore difficult to penetrate the pores very well. That is why an intense sanding is important in order to protect it, otherwise the product used will not penetrate it well. When it comes to ipe, two degrees of transparency are available : translucide and transparent. These two finishes are very interesting because they do not hide the grain of the wood. The translucide finish, can give an aspect of wet wood. For these types of project we recommand and use oils taylored made for this exotic wood. Ipe oil is natural, does not flake and accentuates this wood’s unique look. We apply a single coat on the surfaces using lambswool applicators and wipe the residual product off the wood. Maintenance : A single coat every year needs to be applied otherwise the wood will become greyish. Transparent finishes with a mild pigment all demand the same method of application. However, not all types of products can be used on ipe. Ipe is very dense and its pores are difficult to penetrate. Coventional stains are often ineffective on this type of wood since they are unable to adequately penetrate the wood. We use a specialized stain taylor-made for exotic woods. The stains that we use for ipe are very efficient and they will keep their finish throughout the season. Two coats need to be applied on the first year the wood is stained. We dilute the first coat with the help of a product called Pénétrol or Fluetrol to help the stain penetrate the pores of the wood. Maintenance : A single coat needs to be applied every year. However, after four years of maintenance, the same process needs to be re-done every two years. Teak is an exotic wood that is imputrescible. Teak is a extremely durable wood, but it needs an adequate treatment to ehance its characteristics. Much like ipe, the pores of teak are very fine and need specialized product. Therefore, many different products have become available. To restore, maintain and stain teak we use a range of products in two steps. That is to say, we apply a stain, followed by a sealer. During the initial application, we apply a coat of stain followed by a coat of sealer. During the maintenance only a coat of sealer is necessary. 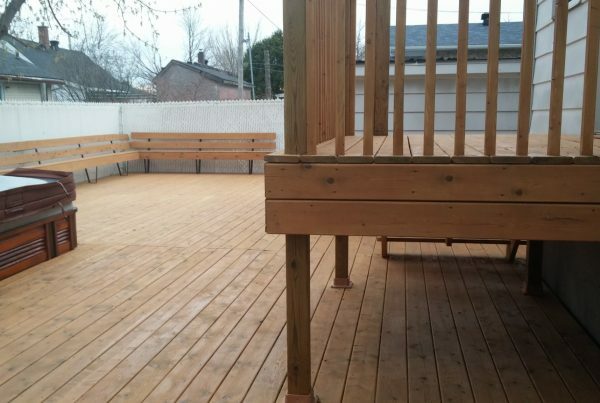 Maintenance : We apply a coat of sealer every year to prevent the wood from becoming greyish and maintain the initial color of the stain. 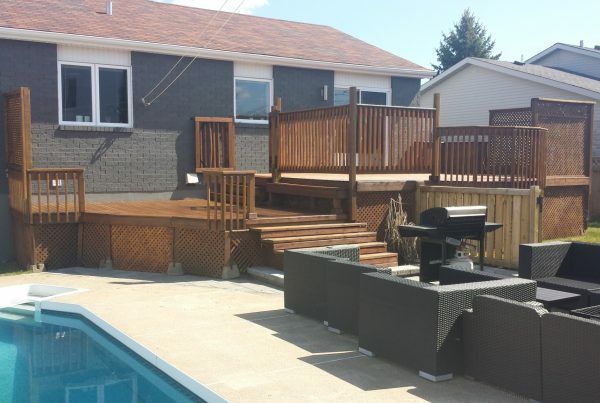 The maintenance is very easy and helps keep your deck almost intact every years after its construction. 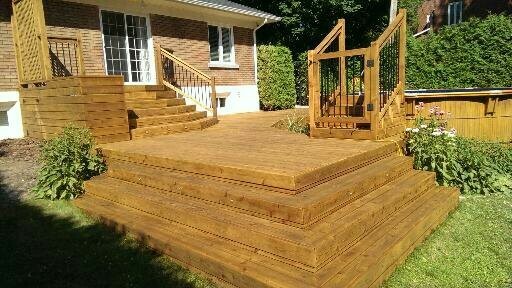 Cumaru is also an exotic wood and it is becoming more and more popular in Quebec. Cumaru has similar characteristics to ipe and therefore, needs the same steps to maintain it. However, once oiled Cumaru has an orange-like color that does not please everyone. Therefore, we suggest and offer oils that are lightly pigmented to counteract the natural color of the Cumaru. We have 12 different colors and the colors that we use are very efficient and beautiful. Maintenance : A new coat is necessary every year to revive the color and preserve the wood in its entirety. 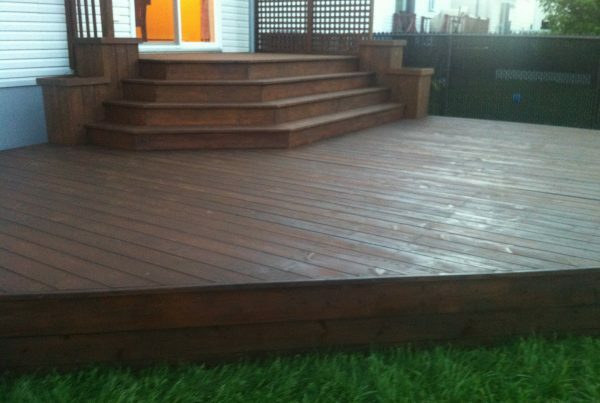 Additionally, even if the maintenance is not done in a specific year then the stain will simply fade. 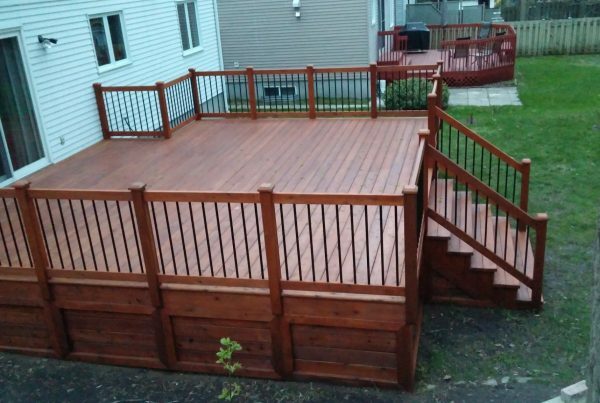 Give a second life to your deck?